I once wondered about the physics of the 'orbits' that people follow to avoid the Visa card salesman/triple A lady/charity worker in public places. Typically one speeds up as you get close and then you slow down once you are past the point where they can utter 'can I interest you in' and you know that they know you heard them. It probably conforms to Kepler's second law of planetary motion. Anyhow, the reason I mention this is that today I had some fun chatting with the market research folks (because knowing in your gut that there will be demand is not sufficient. Investment requires proof!). And halfway through the conversation I realised that at some point soon, people in a nearby city are possibly going to be 'orbiting' some poor soul who will be standing there will the purpose of asking questions about the attractiveness of airship experiences*. 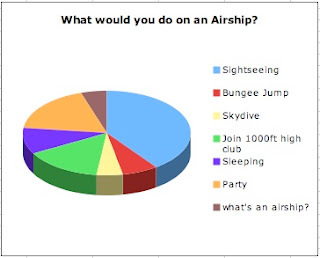 "And how likely are you to be interested in taking a flight? "Very interested, interested, somewhat interested or not at all interested." *sadly for this post, it will probably be done by phone..